Struggling Guernsey FC slipped to their 19th defeat of the season as they lost 3-0 at bottom side Godalming Town in Isthnmian League Division One South. Graeme Purdy's hat-trick was the difference between the sides. Purdy, who had not previously scored this season, headed the hosts in front inside 10 minutes before catching out goalkeeper Josh Addison with a cheeky chip at the half-hour mark. The striker rounded Addison for his third late on to complete the win. 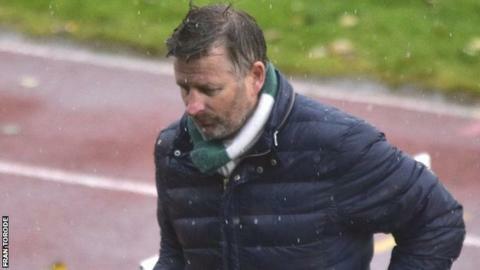 "It was woeful, I'm not going to hide behind anything," said Guernsey boss Tony Vance. "We've had some tough times this season and it was an incredibly bad day at the office. We simply weren't good enough and up for it enough." Despite their win, Godalming stay bottom of the table, while the Green Lions remain just one place above the relegation zone.